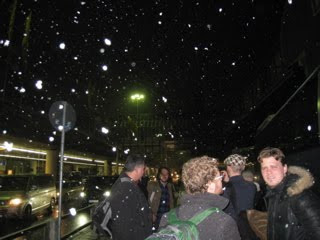 We arrive in Frankfurt in the snow. We had thought the day would include nothing to report - a short flight from Vilnius to Frankfurt and a bus to Siegen in time for Eric to meet his in-laws who were waiting at the hotel for an early dinner and for the rest of us to have an evening at leisure. Well - there was a 'weather situation' (snow) in Frankfurt which kept most flights during the day grounded and delayed our plane getting to us in Vilnius. We spent several not unpleasant hours availing ourselves of the amenities in the Business Class Lounge, then we finally flew on to Frankfurt. As we were just about on the runway to land, we took one of those sudden turns upward. Turns out our runway was occupied. With snow beating on the windows we went around again, and landed not so long afterwards. The snow was pretty heavy on the ground but our bus was waiting and sped us (one forgets how fast they drive here) to Siegen in an hour and a half. The whole day was about two and a half hours behind schedule; it felt like 20 and was more excitement than we had in mind. Again we must reflect on our luck - it wasn't obvious that we would be able to get into Frankfurt today, but we did. AND, we didn't have to connect. So - just to let you know we're here. Eric did have dinner with his in-laws. Our 14th and last concert of this tour is tomorrow night at the Apollo Theater here in Siegen, and - hard to imagine- 48 hours from now we'll be home!